STMicroelectronics is bringing cyber-protection to power-conscious connected devices with the STM32L5 micro-controller (MCU) series featuring the Arm Cortex-M33 core. They provide a CAN FD interface. Building on the Cortex-M33, which boosts protection for small devices by integrating Arm's Trustzone hardware-based security, ST's STM32L5-series MCUs add further enhancements. This included software isolation, secure boot, key storage, and hardware cryptographic accelerators. They also provide long run-times powered by coin cells or energy harvesting. Consuming as little as 33 nA in shutdown mode and achieving 402 ULPMark-CP in the EEMBC (Embedded Microcontroller Benchmarking Consortium) ULPBench. "The STM32L5 series with Trustzone and additional custom protection features considerably strengthens and hardens cyber-protection for small IoT (Internet-of-Things) devices," said Ricardo De Sa Earp, Micro-controller Division General Manager, STMicroelectronics. "Also featuring our unique energy-saving technologies, rich connectivity, and smart digital and analog peripherals, these devices will be the first choice to host cutting-edge connected applications." The MCUs come with integrated digital and analog peripherals, as well as consumer and industrial interfaces such as CAN FD. This way, they provide a platform for products such as industrial sensors or controls, home-automation devices, smart meters, fitness trackers, smart watches, medical pumps or meters, and others. 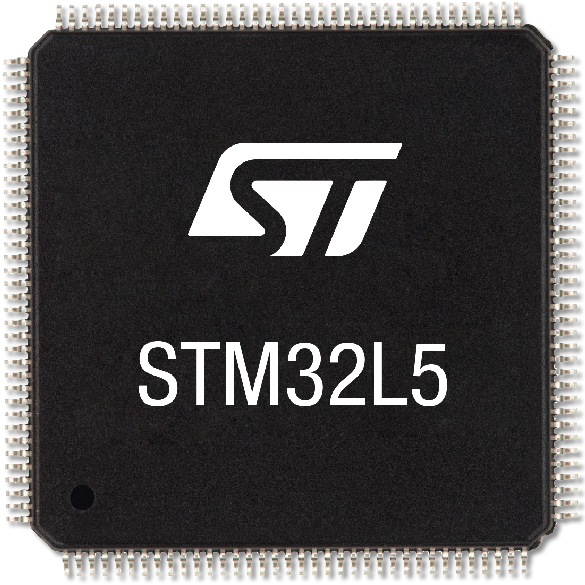 ST will unveiled the STM32L5 series MCUs in a demonstration, created in collaboration with security-software specialist Prove and Run at Arm Techcon, October 16 to 18, in San Jose, California. The series is available in standard temperature grade for consumer and commercial applications, or high-temperature grade specified from -40 °C to +125 °C for challenging environments.